House and Senate leaders from both parties led the ceremony in the stately Statuary Hall to commemorate the 1963 March on Washington for Jobs and Freedom, which helped to pressure Congress to pass the Civil Rights and Voting Rights acts. The bills won passage in 1964 and 1965, respectively. Senate Majority Leader Harry Reid, a Nevada Democrat, noted that after the Supreme Court’s June decision invalidating a key part of the Voting Rights Act, some states moved quickly to implement voting rules that he considers a threat to the votes of minorities, the elderly, women and others. He singled out Texas. His comments drew enthusiastic ap­plause, including from House Democratic leader Nancy Pelosi, D-Calif., who sat onstage alongside Rep. John Lewis, D-Ga., who as a student activist endured a severe beating in the 1965 “Bloody Sunday” voting rights march in Selma, Ala.
House Speaker John Boehner, R-Ohio, and Senate Minority Leader Mitch McConnell, R-Ky., did not applaud Reid's remarks. Boehner turned to McConnell with a questioning glance during the applause. Boehner spoke of the march with historical references, from Abraham Lincoln, who as a Republican senator from Illinois sponsored a bill to free District of Columbia slaves, to abolitionist Frederick Douglass, NAACP activist Rosa Parks and the Rev. Martin Luther King Jr., who led the march and delivered his signature “I Have a Dream” speech from the Lincoln Memorial. “This is a story of how a president, a slave, a seamstress and a minister locked arms across a period of time. A story that shakes us forward and shakes us free,” Boehner said. McConnell recalled that the march inspired him to organize for change in Kentucky, and that he worked to help his boss, a U.S. senator, overcome opposition in Congress to help pass the Civil Rights Act. The original march took place on Aug. 28, 1963. Congress observed the 50th anniversary early because it falls during its August recess. The 1963 march drew approximately 250,000 people to the National Mall. Its purpose was to call attention to economic inequality, but it is most remembered for King’s speech. Lewis, who was a leader of the Student Non-Violent Coordinating Committee in 1963, told Wednesday of his meeting with President John F. Kennedy before the march and of Kennedy expressing wariness that the march might turn violent. 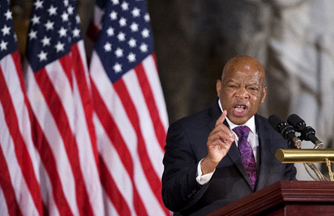 Lewis told the crowd that he sees the March on Washington as one of the nation's finest hours and that it helped usher in a spirit of bipartisanship that moved the country forward. “What would it take for us to come together and make that kind of progress for America once again?” Lewis asked. David Cohen, 76, of Washington, was among those at Wednesday’s ceremony who attended the march. He said he was employed by a Washington lobbyist who was working on passage of the Civil Rights Act at the time. Banks and congressional offices were closed, the National Guard had been deployed and liquor sales were banned out of fear of violence during the march, Cohen said. Cohen and his wife hosted several participants in their apartment, to the dismay of his landlord because of the racial mixing, said Cohen, who is white. Civil rights leaders are planning two major events to commemorate the 50th anniversary of the march: An Aug. 24 march from the Martin Luther King Jr. Memorial to the Lincoln Memorial, and an Aug. 28 march that will stop at the Labor De­partment and the Justice Department buildings. Other activities are planned around the anniversary as well. The Capitol ceremony Wednes­day came as President Barack Obama toured the country to promote his agenda including jobs and economic growth. Obama met with several leaders on the voting rights issue on Monday and pledged his administration would work to strengthen the Voting Rights Act.